One of the primary functional alterations that has been reported in arterioles during hypertension is an increase in their sensitivity to a variety of vasoconstrictor stimuli including the adrenergic neurotransmitter norepinephrine and other vasoconstrictor agonists, elevations in intravascu-lar pressure (myogenic response), and an enhanced constriction in response to physiological stimuli such as increased oxygen availability. The increase in the sensitivity of arteri-oles to vasoconstrictor stimuli in hypertension may have a number of underlying causes, including intrinsic alterations in the electrophysiological responses of the vascular smooth muscle (VSM) cell membrane, changes in the nature and/or production of chemical modulators of vascular tone produced by the endothelium or by the vascular smooth muscle cells themselves, alterations in intracellular Ca2+ homeo-stasis or in other second-messenger systems regulating contractile function, and the potential effects of increased sympathetic nerve activity, humoral factors, and elevated arterial pressure per se in enhancing the sensitivity of the vessels to other vasoconstrictor stimuli. between transmembrane potential and active tone in the smooth muscle cells, alterations in the electrophysiological responses of the VSM cell membrane could contribute to both an enhanced response of arterioles to vasoconstrictor stimuli and to an impaired relaxation in response to vasodilator stimuli in resistance vessels of hypertensive individuals. 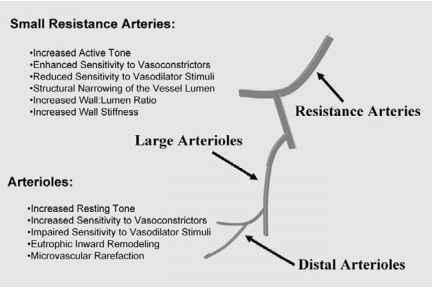 In this regard, it is important to note that resting Em in the VSM cells of in situ arterioles and resistance arteries lies within the steep portion of the Em-active force relationship, or very near the threshold for mechanical activation of the smooth muscle. Therefore, arteriolar tone is very sensitive to activation by vasoconstrictor stimuli such as norepinephrine and transmural pressure elevation, which would result in depolarization and VSM contraction. In hypertension, enhanced sympathetic nerve activity, elevated levels of intravascular pressure, and local or circulating humoral factors not only could activate the vessels directly via depolarization of the VSM cells, but also could bring VSM Em closer to the threshold for mechanical activation, which would increase the sensitivity of the arterioles to other vasoconstrictor constrictor stimuli that act via membrane depolarization. Several types of voltage-sensitive ion channels, including L-type Ca2+ (CaL) channels, voltage-gated K+ (KV) channels, and high-conductance voltage- and Ca2+-sensitive K+ (BKCa) channels, play a crucial role in the regulation of arte-riolar tone, and many studies suggest that high blood pressure may trigger cellular signaling cascades that alter the expression of different ion channels in arterial smooth muscle, leading to further modifications of vascular tone. There is substantial evidence that calcium current through Ca2+L channels is increased in blood vessels of hypertensive animals, which would contribute to an enhanced response to vasoconstrictor stimuli. 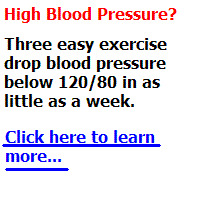 There is also evidence that Kv channel current is reduced in vessels of hypertensive animals. This reduced Kv current would tend to depolarize the VSM cell membrane, resulting in increased resting tone and an enhanced response to vasoconstrictor stimuli. On the other hand, KCa channel current at physiological membrane potentials is significantly higher in cerebral arterial smooth muscle cells from spontaneously hypertensive rats (SHRs) compared to those of normotensive Wistar-Kyoto (WKY) controls, apparently because of an increased density of the KCa channels in the VSM cell membrane. These findings suggest that elevated levels of blood pressure lead to increased KCa channel expression in vascular smooth muscle membranes as a compensatory mechanism to offset the enhanced Ca2+ current and reduced Kv current in the cells. In the absence of this compensatory increase in KCa channel expression, the increased Ca2+ current and the reduced Kv current in the VSM cells could lead to a "vicious cycle" of positive feedback that would cause intense vasoconstriction and severe hypertension. As noted earlier, alterations in the nature or release of chemical modulators of vascular tone, including a variety of arachidonic acid metabolites, could also contribute to an enhanced response of arterioles to vasoconstrictor stimuli. For example, there is evidence that the release of the vasoconstrictor substances endothelin, prostaglandin H2 (PGH2), and/or thromboxane A2 (TxA2) from the vascular endothe-lium contributes to the enhanced myogenic response to pressure elevation in arterioles of spontaneously hypertensive rats. Release of PGH2 and/or TxA2 also appears to contribute to an enhanced response to vasoconstrictor stimuli in SHRs and other forms of hypertension. Studies of the role of these compounds in the potentiation of the myogenic response to transmural pressure elevation in hypertensive animals suggest that these endothelium-derived constrictor substances increase the Ca2+ sensitivity of the contractile apparatus of arteriolar smooth muscle cells in hypertension, so that similar increases in internal Ca2+ concentration in the VSM cells during pressure elevation in the vessel cause an enhanced myogenic constriction of arterioles. The latter observation suggests that intracellular signaling cascades (in addition to changes in VSM Em) can participate in the altered vascular responses to vasoconstrictor stimuli occurring in arterioles of hypertensive animals. There is also evidence that elevations in intravascular pressure can increase the formation of superoxide anion in arterioles, which could then interfere with nitric oxide (NO)-dependent vascular relaxation and potentiate myogenic responses indirectly. The enhanced myogenic response and the increased constriction of arterioles in response to elevated Po2 that have been demonstrated in many forms of hypertension could also be due to an enhanced production of 20-hydroxye-icosatetraenoic acid (20-HETE) or to an increased sensitivity of the smooth muscle cells to the vasoconstrictor effects of 20-HETE, a metabolite of the cytochrome P450 pathway of arachidonic acid metabolism that has been implicated in mediating myogenic responses to transmural pressure elevation and arteriolar constriction in response to increased Po2. This is an audio all about guiding you to relaxation. 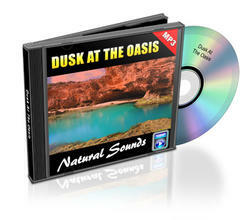 This is a Relaxation Audio Sounds with sounds from Dusk At The Oasis.